If you’re not familiar with Amazon marketing, you probably should be. Sponsored Products are ads you can run through Amazon, designed to feature a product in a way that makes it look recommended by the platform. Think of it like native advertising for Amazon. They’re immensely popular, and will only grow more popular as their use catches on. Better to get in now while the getting is good, optimize to be at the top of the pack, and get a head start on the future of Amazon marketing. If you’ve ever browsed Amazon, at least without an adblocker, you’ve seen products in the search results with a Sponsored label next to them. These look like any other product listing in the search results, appearing at the top and bottom of the results page, only they have a “sponsored products” category heading. They can appear in many categories, though not all product categories allow them. Appliances, Automotive, Beauty, Collectibles, Computers, Electronics, Art, Grocery, Luggage, Music, Outdoors, Shoes, Software, Sports, and Video Games are just some of the available categories. Sponsored products are ads designed to send traffic from the search results page to the product detail page for the product you choose to advertise. You don’t have a ton of flexibility with the copy for the ads; you can choose which product and which details of the product are most relevant, but you can’t completely customize the ads. 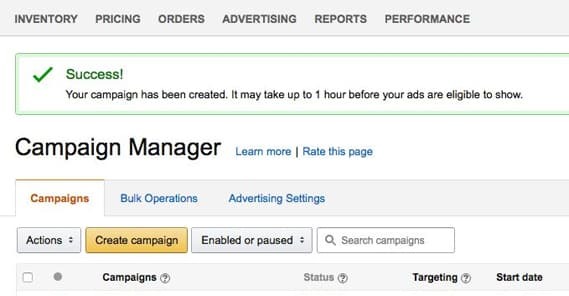 What you can do, however, is adjust a lot of the behind the scenes elements to improve the visibility and click-through rates for these ads. Let’s talk about how. There are a lot of options available to you for optimizing your product ads. I’ve compiled 20 pieces of advice you can use. Play around with them, experiment, and figure out what works best for your products in your categories. First up, you should understand that there are two types of campaigns, and what the benefits and drawbacks are to each of them. They are Automatic and Manual, and they are different types of targeting. 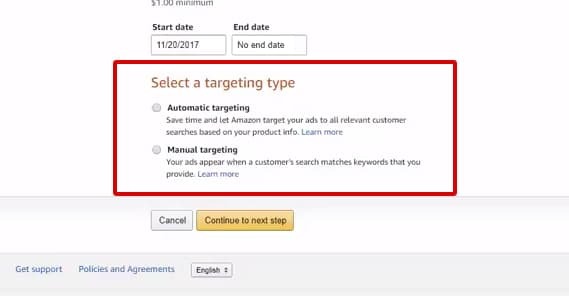 The difference between the two is pretty simple: Automatic targeting allows Amazon to choose which keyword searches are relevant to the product, and thus where to show your ads, based on your product page copy. Manual allows you to choose specific keywords to run for your ads. Automatic targeting is, obviously, easier and less time consuming to run. Manual gives you more control, and thus typically higher click rates and better results – assuming you optimize properly – but has a higher time investment and a greater chance of failure. Start by running automatic campaigns. This allows Amazon to use their vast array of customer data and intention analytics to figure out how to advertise your products for you. They won’t be the best converting ads, or the cheapest ads, but they’ll be a middle of the road level of serviceable. You won’t be wasting a ton of money or leaving a ton of conversions on the floor. The key to success with Amazon sponsored products is to start with automatic campaigns for at least a month, to gather data. The data Amazon will provide you is invaluable to future optimizations. Everything in your storefront is something you believe will sell. All too often, I see Amazon marketers get tunnel vision, hoping to increase sales of the products they feel are most successful, leaving their other products in the dust. If you have a huge catalog, you might not have the budget to advertise for all of them, but you should definitely experiment. The problem here is that all too often your successful products are successful because you’re already reaching a significant part of your audience. Sponsored product ads will make them a bit more successful, but it might not be as big a benefit as advertising a less successful product. If you consider that you’re only as successful as your least successful product, it makes more sense to raise up the underperformers than to boost the overperformers even more. 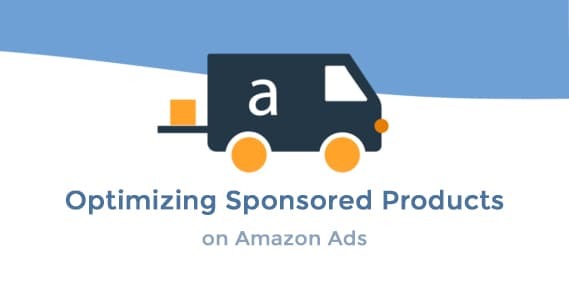 When you run an ad campaign with Amazon sponsored products, you can add as few or as many individual product SKUs to the campaign as you like. 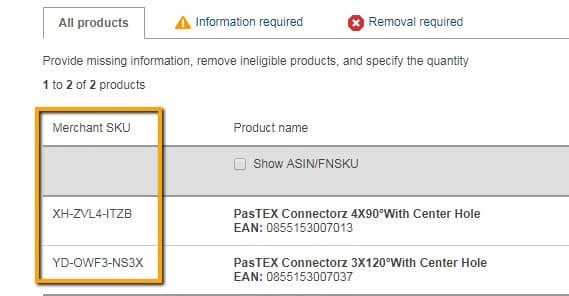 I highly recommend you only add one SKU per ad group. Why? 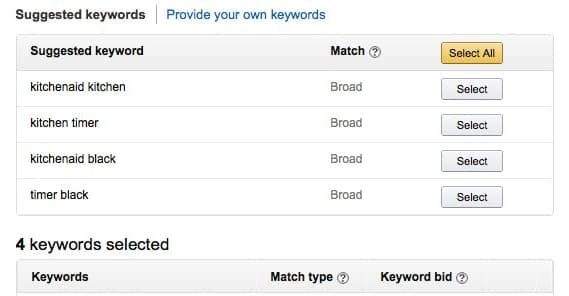 Amazon’s analytics used to provide detailed data about your ads, including which keywords drew in clicks to which SKUs. However, they wiped some of this data, and now you can see which keywords are bringing in how many clicks and sales, but you can’t see which SKU in the ad group brought in that data. However, if you only have one SKU in the ad group, you know that it’s that one SKU that brought in that performance. This is a lot easier with small catalogs than larger catalogs, of course. If you have 30 products, managing 30 ad groups is relatively easy. If you have 1,000 products, managing 1,000 ad groups becomes a lot harder. This is less of an optimization tip and more of a time-saving tip. If you have over, say, 100 products, you should probably make use of Amazon’s Bulk Operations for Sponsored Products. This is a tool that allows you to essentially automate the creation of sponsored product ads for your product catalog. It will require a little bit of excel wizardry, but it allows you to manage a large number of ads simply by uploading a spreadsheet, rather than having to manually create and specify details of ads for every single SKU or keyword you want to use. 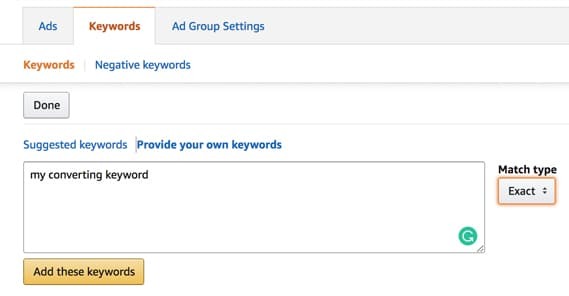 As already mentioned, Amazon’s analytics will provide you information about the ad groups you run, including how well that ad group performed and for what keywords. When you have one SKU per ad group, you can draw a direct set of data: this SKU performs X well for Y keywords. After you run your ads for at least a couple of weeks, if not a month, check your search term reports and see how well your products have performed, and for which keywords. The data you harvest needs to be understood before you can use it for further optimizations. 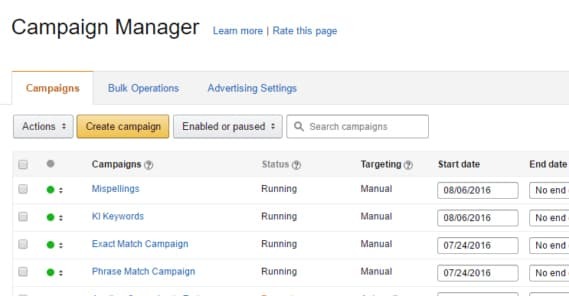 Amazon will report a variety of different metrics, which you can attribute to individual SKUs if you divided up your ads as I mentioned in step 4. Number of orders. This is the number of conversions per keyword per SKU. Be sure to normalize this by time, otherwise it will look like older ads are performing better than newer ads based on this metric alone. Sales. Similar to the above, this is the number of sales of a SKU per keyword for the ad. This includes individual product sales, however, and thus will be higher in cases where one order included multiples of the same product. Clicks. The number of times a sponsored product ad was clicked, per keyword per SKU. This allows you to calculate the conversion rate for individual ads. Using the data Amazon gives you, you can correlate trends and figure out where you want to focus your energies. Export your data and start making some charts. Compare each SKU and the keyword data for that SKU, compiling lists of the best keywords for each. For each keyword, calculate the clicks-per-sale rate, and identify the best handful of keywords for each ad group, which will correspond to each SKU. 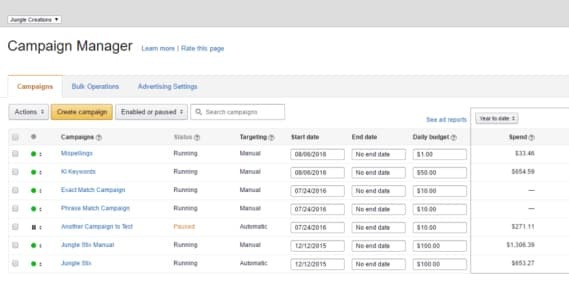 Once you have your data correlated and ready to go, you can cancel the automatic campaigns for certain products and replace them with manual campaigns. Specify which keywords go with which SKUs and run those ads without the additional exposure in underperforming keywords. Keep an eye on these and make sure the data continues to perform. Broad keyword matching is any search term that includes part of the keyword or a synonym thereof. If you’re advertising “green mascara”, your ad will show up for product searches including “emerald mascara” or “green makeup” or even just “mascara.” Use these for exposure and to gather data about what modifiers your customers are most likely to use. Phrase matching for keywords means the full phrase must be part of the search term, but the search term can include additional words. 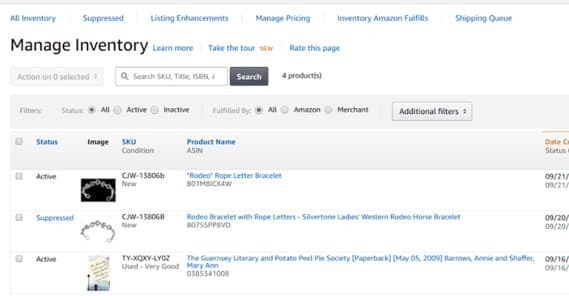 Amazon will also take close variations into account, including typos and close synonyms. This is useful for more refined ads once you know which keywords work best. Exact match, as you might expect, is specifically your keyword and no other words, synonyms, or phrases. Use this only once you’ve drilled down to the most effective keywords and know they’re going to last for a while. If the keywords have high seasonality, you’ll need to keep a close eye on when they fall off and cut off the ads before you waste too much of your budget. Negative keywords are keywords that you include if you specifically don’t want your ad to appear for those searches. For example, if you know users are searching for organic or natural makeup and your mascara is not all-natural, you can include natural/organic as negative keywords. This will prevent you from advertising a product to people who aren’t going to buy it because it doesn’t match what they want. Your advertising cost of sale is essentially your potential profit margin. You can calculate this by taking your total ad spend, dividing it by your total sales value, and multiplying the result by 100 to get your percent. Products with a low ACoS should have higher bids to get more traffic. Products with a high ACoS probably have a lot of traffic but few conversions, and may be an opportunity to prune out an underperforming keyword. The larger your catalog, the harder it is to advertise everything in it with a limited budget. Periodically rotate out the majority of your ads until you’ve advertised everything in your catalog for at least a base amount of time, typically two to four weeks. Rotate out 90% of your ads, while keeping your top 10% best performing ads, until you have base data for everything. From there, keep your top performing 50% and rotate through your remaining 50% with experiments to see how they can be optimized. Make sure, when you’re optimizing your sponsored product ads, that you know your goals. Are you trying to achieve the most revenue, or the highest number of sales in general? This can affect how you adjust your keywords and bidding strategies. In some cases you might be focusing on the highest return on ad spend, while other times you simply want sales numbers and even breaking even works fine. The general progression for a single SKU is to run automatic ads to harvest initial data, then run manual ads to optimize on that data. However, sometimes you’ll end up pursuing a dead end with underperforming ads all around. In these cases, consider returning to automatic ads to harvest fresh data and look for a new place to start. When you’re creating your sponsored product ads, you can use as few or as many keywords you want. How many should you use? I recommend somewhere in the range of 25-50. Too many keywords will spread your ads too thin, while too few will fail to capture large portions of your audience. Consistency is key when you’re comparing your data. Try to avoid comparing apples to oranges. If you’re determining which of two products should be advertised, make sure you’re not comparing an ad that ran for two days to an ad that ran for a month, or one with 10 keywords and one with 500. 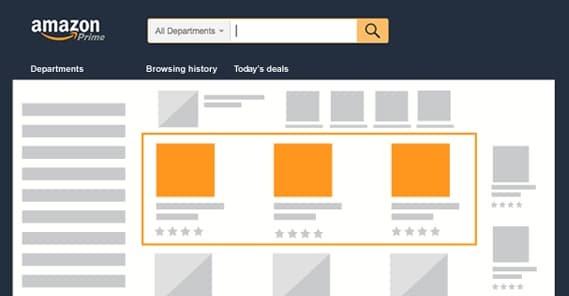 Amazon’s product ads pull data from your organic product page, with all of the images, details, and information you include available for them to choose. Since you can’t really optimize your ad copy, optimize your product listings instead.